While many of the stages of the cell-mediated immune response are known, the mechanisms by which various white blood cells can specifically bind (and release) to initiation proteins are not as well known. Some of the challenges to understanding are due to the short time period of this binding and initiation, as well as the short lengths of proteins involved in the process, which can make it difficult to detect the nonpolar and polar domains involved in specific binding. At the University of Buffalo, Michael Hill, Ph.D., used Reichert Technologies’ surface plasmon resonance (SPR) to study the activation and binding properties of HL-60 (human promyelocytic leukemia) cells, which have long been used to study white blood cell proliferation and differentiation. 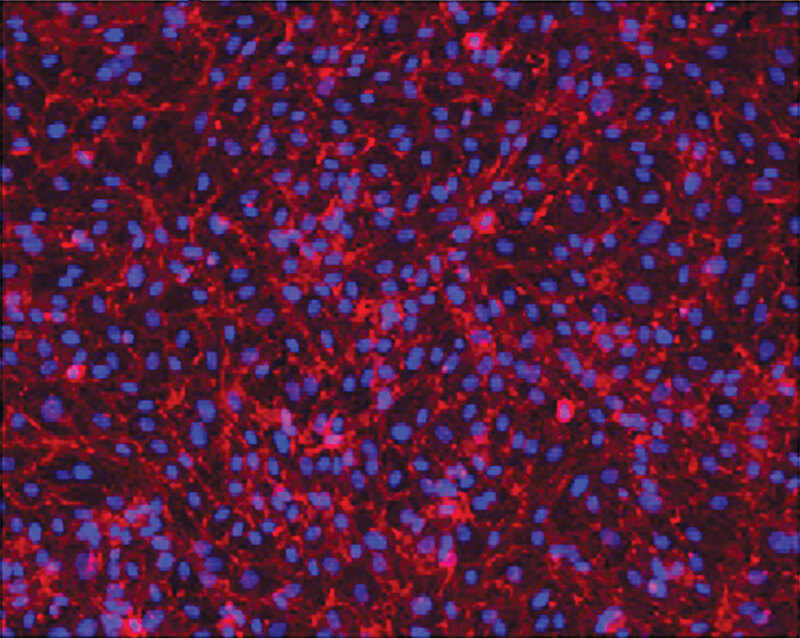 Dr. Hill and his colleagues at the Debanjan Sarkar Lab of Biomaterials and Regenerative Therapeutics used SPR to study specific and nonspecific cell matrix interactions, examining the interactions of endothelial cells with basement membranes and stromal/connective tissue. The research provided insight into why, when cells contact stromal cells in an injury, angiogenesis can start. The surface adhesion study not only provided answers to how diseases like cancer can begin, it also marked an unusual application of SPR technology. The relatively large size of cells, which could clog tubing. The nature of the SPR technique itself, which has a height limitation of <500 nm (beyond which sensitivity is lost). This does not mean that cells cannot be studied with SPR or that kinetic data cannot be obtained. Experiments can be designed to obtain kinetic on- and off-rates as well as affinity values. If an optical flow cell and microscope are available (or just a microscope if the slide is removed from the instrument), imaging can be carried out. Examples of how SPR has been used to analyze cell-binding interactions include the study of cells binding to proteins and experiments involving bacteria-antibody interactions. Forces that influence the interactions involved in cell adhesion include Van der Waals forces, which decay over distance (1/radius6), and hydrogen bonding and double-layer forces, which are stronger but decay more quickly with distance. “Nonspecific, longer-range forces are important during cell adhesion,” Dr. Hill noted. “Protein coats present their own surface field, and specific interactions overcome those shielding effects.” These specific interactions involve peptides that bind to targeted domains of protein integrins. In Dr. Hill’s study, researchers found that SPR could be used to help determine what types of proteins were most likely to bind to a cell, based on the unique cell surface energy of each protein. 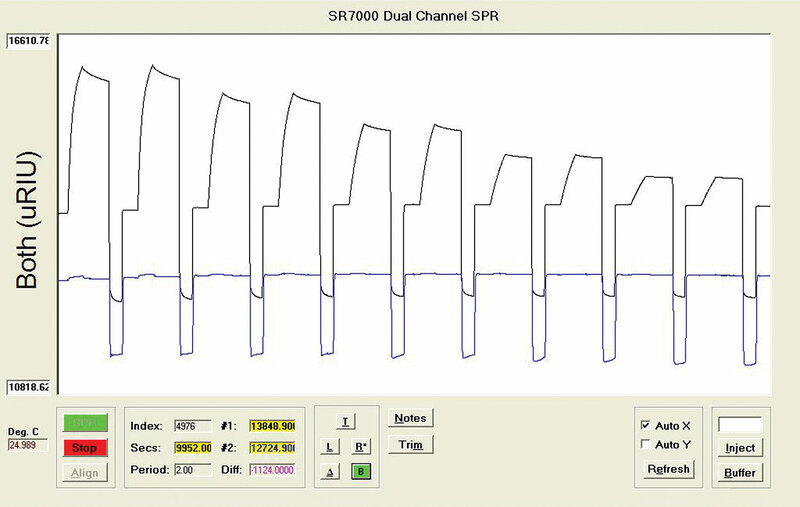 SPR was used to measure interactions of molecules through multiple protein interlayers of a cellular matrix. The researchers found that differences in cell adhesion to immobilized proteins could be related to protein surface energy—high surface energy proteins had a greater tendency to bind cells. These surface energy measurements could predict optimal conditions for cell capture and adhesion, and could help optimize cell-binding conditions on the SPR sensor chip. The researchers also looked at specific adhesion of HL-60. In this study, SPR confirmed specific cell adhesion activity across multiple protein layers, even though the SPR signal distance was limited to 500 nm. Hence, SPR was able to closely monitor how cells spread on ligand-bearing substrates, which cannot be seen using standard microscopy. Dr. Hill’s study showed that SPR can provide valuable information on specificity of white blood cell binding during the initiation of an inflammatory response, even when studying this interaction across multiple protein layers. Dr. Hill looked at the specific interaction between immobilized P-selectin and white blood cells (HL-60). During inflammation, white blood cells are recruited to the injury site by selectins that are released by endothelial cells. Selectins tether to white blood cells and thereby determine the rate of recruitment at the injury site. Dr. Hill used a Reichert SR7500SR DC system with a modular tubing and flow chamber, which allowed for a wider variation in tube diameter and flow rates, avoiding many of the clogging issues that have challenged SPR work using other systems. There is increased interest in using whole cells rather than fragments for studying biomolecular interactions. The main reason is that intact cells are more like what is actually found in nature. Experiments are sometimes also run at 37°C for that reason. As a subset of this research, additional studies have also been carried out using SPR to study bacteria (different pathogens). Results for an SPR kinetic run, providing dissociation rate, equilibrium dissociation, and association constants in one experiment. There are a number of things to consider when studying whole cells. Working with whole cells can be difficult as they tend to be sticky and may clump or aggregate. Using a flow cell and tubing that are a bit larger than what is typically used with SPR (if available) can improve the chances of success and minimize the likelihood of a clogged system. A planar sensor chip is preferred, since it minimizes the height of the base matrix. When cells are coupled to the chip, choice of a suitable substrate to capture the cells is also important (depending on the type of cell, substrates like fibrinogen, poly-l-lysine, and collagen have been used). Environment is very important in keeping the cells active on the surface. For example, running buffer additives can influence the activity. Activity is also influenced by the type of cell being studied—a cancer cell might stay active on a sensor chip surface for a longer period than a HEK (human embryonic kidney) or CHO (Chinese hamster ovary) cell. Cells have been used both as a target (they can be captured over an immobilized substrate) and as the analyte for binding studies using SPR. If cells are attached to the sensor chip, then a KD value (affinity or equilibrium dissociation constant with units of molarity) can be obtained for analyte binding. Due to the height of cells on a sensor chip surface (typically microns) and the limitation that SPR signal decreases with distance from the chip (no signal is expected at >500 nanometers from the sensor chip surface) it is likely that only part of the cell is being sensed. Since regeneration can be difficult or incomplete, this type of experiment is sometimes run via titration of analyte over the cells on the surface. In some specific instances, a combination of increased flow rate and a regeneration solution can work well for surface regeneration. If the experiment is designed in the opposite way, where a protein is coupled to the surface and the cells are injected over it, an actual KD value in molar units cannot be obtained. Off-rates can be calculated, since they are independent of concentration, but on-rates can only be calculated using a cells/unit volume value for concentration, rather than molarity. Since nonspecific and specific molecular interactions are operating simultaneously during cell adhesion, it was important to use methods that could analyze both, simultaneously and in real time. “Since the two types of adhesions often coexist in certain biological contexts, SPR is useful to dissect intermolecular force characteristics of cell adhesion in different model systems, especially at short length and time scales,” said Dr. Hill. Sensor chips with immobilized cells after overnight capture. Mary Murphy, Ph.D. (mary.murphy@ametek.com), is applications scientist at Reichert Technologies.